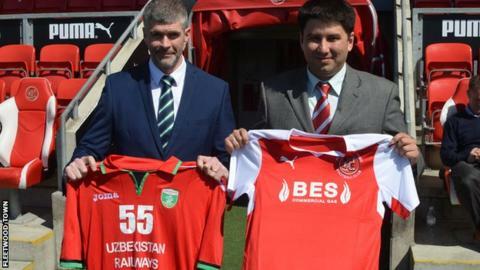 League One side Fleetwood Town have announced a partnership with Uzbekistan club Lokomotiv Tashkent. The two clubs will develop commercial opportunities and the Cod Army are expected to go on a pre-season tour to Uzbekistan in 2016. The deal also includes sharing of on and off-field knowledge. "I see them as a role model in the UK football as they've developed from the very bottom up," said Lokomotiv's marketing manager Davron Azizov. He told BBC Radio Lancashire: "We started in the second league and we're succeeding in the Premier League of Uzbekistan and playing in the Champions League. "In the future we want to put all efforts together to develop a good partnership base on youth development." Fleetwood were playing in the ninth tier of English football as recently as 2005, but helped by the financial input of chairman Andy Pilley, they were promoted to League One last season. The Lancashire side are planning to include an international academy in their new training facility, where young players from Uzbekistan and Central Asia can come and train. The British Ambassador in Uzbekistan, George Edgar, will host Fleetwood representatives when they visit the country on their tour.